HHS’s first publication in 1976, edited and revised by Dr Joan Schwitzer. 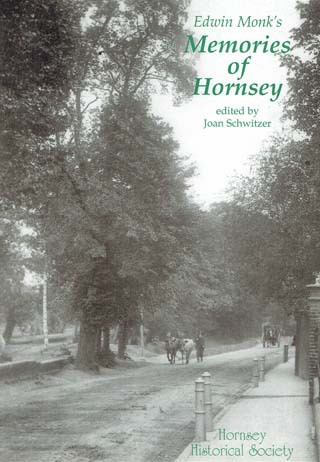 Monk’s recollections of Hornsey in the 1880-1890s now includes additional material by the author subsequent to the original publication. It is also embellished by contemporary photographs including nine from the esteemed North Middlesex Photographic Society Collection. Edwin Monk was born in 1879 and moved to Stroud Green with his family when he was six years old. He died aged 99 in 1978. His longevity meant that he lived through a period of rapid suburban development. His remarkable memory allied to his long standing interest in local history meant that in old age he could recall in detail the neighbourhoods he knew when he was young.